While visiting a boutique or fashion, the very first thing we see, are the dummies, DIY dress form and the DIY mannequin wearing the model fashion dresses and jewelry which inspire the onlookers and compel to make a purchase! Along with amazing displays of fashionable clothes, dress forms can also play a big role in sewing best fitting clothes! For example, if you no more trust in your tailor’s measurements, you can simply make a dress form of your body to sew the right sized clothes for yourself! A DIY dress form of your body will also allow you to fit and alter rest of your clothes in such a way that they would be exactly around your body lines as you want them to be! So by noticing all these benefits of a dress form, if you have decided to get a dress form of your body then you can make it at home by spending a few bucks! Check out this nicely detailed DIY dress form tutorial and make your own dummy or upper body mannequin at home! Making a dress form of you at home will be a damn budget-friendly idea than to buy an expensive one from the market! So you can simply get crafty with a few rolls of duct tape and plastic wrap to start making a DIY mannequin of yourself at home with the help of a friend! Here is a super cost-efficient plan to make a great looking mannequin for your fashion dress shop! Checkout the step-by-step instructions here! The very first thing to remove your shirt and to wear a bra that should go smooth to your body lines! Now hire a friend and ask him/her to wrap your upper body including half thighs in the plastic paper! Now layer the duct tape on the wrapped plastic paper, start by making a cross on your chest! 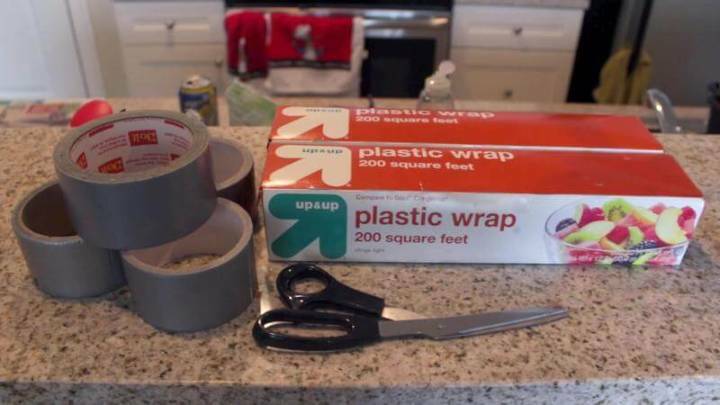 Now make a duct tape loop just below the chest and cover up the entire body using short stripes of duct tape! Avoid bumps and creases, to do so use short stripes of duct tape, longer would be the stripes the more likely they may be to fold or get bumps! Cover up all the parts, don’t leave any even an inch! Note: While applying the duct tape, make sure that your whole body is covered with plastic wrap and there is no whole! Otherwise duct tape may stick to your skin which may be hard to remove without peeling your skin off! Now cut your duct tape dress form or dummy straight up starting from side using medical scissor! Here again your friend will do it! Now safely remove the duct tape mannequin!!! Tape back the side you have cut! Now time for stuffing the duct tape dummy! Use grocery bags, cotton, pillow stuffing or expandable foam for this purpose! After neat and clean stuffing, close the leg wholes using duct tape and you are done. A handmade dress form is ready to go in your shop. Make it wear an ideal fashion dress and set to display. Ever low-cost dress form built with hands and at home. It would only cost you $10 unlike those market bought mannequins that cost’s you hundreds of dollars.